Though most treacle tart recipes on the internet mention that it's Harry Potter's favourite dessert, I couldn't find much detail or thought on the matter. So, to remedy such a terrible situation, I skim read the books again to find the quotes (thankfully I know them well enough that it only took an afternoon) and then got sucked in and shed yet more tears at the end. As I think I've mentioned before, Harry Potter was a big part of my teenage years. The books will always be special to me - as, I think, they are to many of my generation, those of us who grew up with them, year by year, as we went through secondary school. I wrote my first quote-backed, detailed arguments about the books (H/Hr forever) and I genuinely think those arguments taught me more than most of the English lessons at my school. As Harry helped himself to a treacle tart, the talk turned to their families." Harry Potter and the Philosopher's Stone, Chapter Seven, The Sorting Hat, p. 93. And she refused to eat another bite. The rain was still drumming heavily against the high, dark windows. Another clap of thunder shook the windows, and the stormy ceiling flashed, illuminating the golden plates as the remains of the first course vanished and were replaced, instantly, with puddings. But Hermione gave him a look so reminiscent of Professor McGonagall that he gave up." Harry Potter and the Goblet of Fire, Chapter Twelve, The Triwizard Tournament, p. 162. "Harry was too used to their bickering to bother trying to reconcile them; he felt it was a better use of his time to eat his way steadily through his steak and kidney pie, then a large plateful of his favourite treacle tart." Harry Potter and the Order of the Phoenix, Chapter Eleven, The Sorting Hat's New Song, p. 191. "'You missed the Sorting, anyway,' said Hermione, as Ron dived for a large chocolate gateau. 'Hat say anything interesting?' asked Harry, taking a piece of treacle tart. Draco Malfoy was miming the shattering of a nose to raucous laughter and applause. Harry dropped his gaze to his treacle tart, his insides burning again." Harry Potter and the Half-Blood Prince, Chapter Eight, Snape Victorious, p. 155-7. "The dungeon was, most unusually, already full of vapours and odd smells. Harry, Ron and Hermione sniffed interestedly as they passed large, bubbling cauldrons. [...] They chose the one nearest a gold-coloured cauldron that was emitting one of the most seductive scents Harry had ever inhaled: somehow it reminded him simultaneously of treacle tart, the woody smell of a broomstick handle and something flowery he thought he might have smelled at The Burrow. He found that he was breathing very slowly and deeply and that the potion's fumes seemed to be filling him up like a drink. A great contentment stole over him; he grinned across at Ron, who grinned lazily back. 'It's the most powerful love potion in the world!' said Hermione. 'And the steam rising in characteristic spirals,' said Hermione, enthusiastically, 'and it's supposed to smell differently to each of us, according to what attracts us, and I can smell freshly mown grass and new parchment and -'"
Harry Potter and the Half-Blood Prince, Chapter Nine, The Half-Blood Prince, p. 174, 176. "Harry's scar was becoming more and more painful. He stood up. At once, Kreacher hurried forwards. 'Master has not finished his soup, would Master prefer the savoury stew, or else the treacle tart to which Master is so partial?'" Harry Potter and the Deathly Hallows, Chapter Twelve, Magic is Might, p.191. Harry attends five sorting feasts over the years and, as the quotes show, he eats treacle tart at four of them. The sorting feasts are about arriving at Hogwarts - first, as a new student, getting to know the people around him - and then, later, being welcomed back to the first real home he can remember. The treacle tart heralds a time of friendship, belonging and being looked after. I think that's why Harry smells it in the Amortentia and why it attracts him so much. And so from Harry's first night at Hogwarts to bickering about S.P.E.W., from potions to burning scars, the sweet and comforting treacle tart runs through it all. I wrote my first post about treacle tart just over four years ago. At the time I thought I couldn't replicate the tart of my childhood, but I think I've got pretty close now (except for the pastry, but I've decided I prefer my pastry anyway). As you can see above, the filling is formed from golden syrup, breadcrumbs, lemon juice, egg and a touch of cream. I've tried adding other bits like ground ginger and lemon zest but they started to mask the pure flavour I love. I also tried a tablespoon of black treacle to see if it deepened the flavour but it totally overwhelmed it with a metallic tang (I've seen some recipes on google that make treacle tart with just black treacle, which - much as I like treacle - sounds awful). I also don't believe in lattices or anything like that - the crust is one of the best bits and it doesn't need more pastry. I know it can appear to be a slightly odd idea, but it's genuinely one of my favourite desserts. Sieve the flour, sugar and salt into a mixing bowl. Cube the butter, add to the bowl and rub in (see foundation for help). Add the milk and bring together with your hands into a ball (see video here, though you shouldn't have butter lumps left). Squish into a disc, wrap in clingfilm and leave to rest for 20-30 minutes in the fridge. On a lightly flour-dusted surface, evenly roll the pastry out to a circle that's roughly 12"/30cm in diameter. Transfer the pastry to the tin and let it rest in the shape for five minutes in the fridge (see first video above). Take out again and press carefully into a 8"/20cm round tart tin, making sure you get into the corners. Trim the edge, keeping a few scraps (see second video above). Place into the fridge and chill for 20 minutes or until cold and hard. Preheat the oven to 180C/350F (fan). Line the pastry case with baking parchment (I used parchment lined foil in the photo) and then fill to the top with baking beans or weights. Place into the oven and bake for 15 minutes. Once the case is in the oven, make the filling. Weigh the syrup and breadcrumbs into a mixing bowl then add the remaining ingredients and whisk together until uniform. Leave to sit while the case bakes. After the 15 minutes carefully lift out the beans in the parchment. If you have any small cracks, fill with a tiny bit of leftover pastry. Place back into the oven and cook for 5 minutes or until the bottom looks cooked (paler, drier). Give the filling another stir then scrape into the tart case. Place back into the oven and reduce the temperature to 160C/320F (fan). Bake for 25-30 minutes until set in the middle and browning around the edges. I keep mine in the fridge and it's good for about 5-7 days - in fact I think the filling tastes better as time goes on. You can serve it slightly warm, room temperature or even, as I've recently discovered I like it, from the fridge (it's slightly chewier and doesn't taste as sweet when cold). I always serve it with clotted cream and I can't imagine it being as good with anything else. * The truth is that there is absolutely no substitute for golden syrup in a treacle tart. You can get it on amazon.com and hopefully in other places too. ** My favourite breadcrumbs to use here are made from the Plaited Milk Bread, but any plain white loaf or brioche-style bread would work (except sourdough, I think). Some people like it with brown bread or a mixture, but I prefer white. I make breadcrumbs by (intentionally or not) letting the bread go slightly stale, then whizzing it up in the food processor. I leave them to dry out on a tray for a bit, then keep them in a bag in the freezer. Edit 07/06/16: I recently made a double recipe, using a 10" tart tin - it worked wonderfully. I had quite a bit of spare pastry with a double recipe, so I'd probably do a 1.5x recipe on that another time. The filling was just the right amount. It took 20 minutes to blind bake and 35 minutes to bake with the filling. I have some exciting news: in September, I start the Cambridge Graduate Course in Medicine! It's a four year accelerated course for graduates of other degrees (medicine is usually a 5-6 year undergraduate course in the UK but there are a handful of graduate courses too). It's not out of the blue, though I imagine it might seem so from the blog. I'm really delighted to have this opportunity and I hope you'll stick with me through this change and as I become a doctor. Blogging is important to me and I want to continue so it shouldn't make too much difference to this space. This is a lovely recipe that I've been making for a year or so. It's lightly enriched with a glossy crust and a soft, cream coloured interior. It's great as bread and toast (especially with butter and jam) and also for dishes that use stale bread like french toast and bread and butter pudding (and the recipe coming next week). It's a simple three strand plait, just like the one I had in my hair for the majority of my childhood. You could also try a more complicated plait with this recipe - I'd love to have a go at an eight strand à la vintage Bake Off. Finally, the Poires au Chocolat 2014 Survey is still open - I'd be very grateful if you could fill it out. If you don't add any comments, it only takes about 30 seconds. To take it, just click here. Place the milk and butter into a small saucepan and heat until the butter has melted and the milk is steaming (scalding the milk helps soften the bread). Pour into a bowl (a metal one will help it cool quickly) and place into the fridge to cool down. Sieve the bread flour, plain flour, sugar and salt into a mixer bowl. Stir together then sprinkle in the yeast and stir it in too. Briefly beat the egg up then remove a teaspoon to another bowl (to use as egg wash later). Check the milk has cooled down to blood temperature or less. If it has, add the milk and the egg to the bowl and stir together until you have a shaggy dough. Knead on the mixer with the dough hook (I use 6 on my KA) for 5 minutes until the dough is silky and elastic. Cover the bowl with cling film and leave to rise in a warm place - it generally doubles in size in roughly 1hr 15 - 1 hr 45 minutes. When it has risen, scrape the dough out of the bowl and divide into three pieces - they should be around 300g each. Roll each piece out into an even rope that's about 30-35cm (roughly 12-14") long. Place them next to each other heading away from you (i.e. looking like I I I) and squish the top ends together, so you have a tripod. Pull one of the outer strands over so that it rests between the other two. Repeat with the outer strand on the other side and so on. 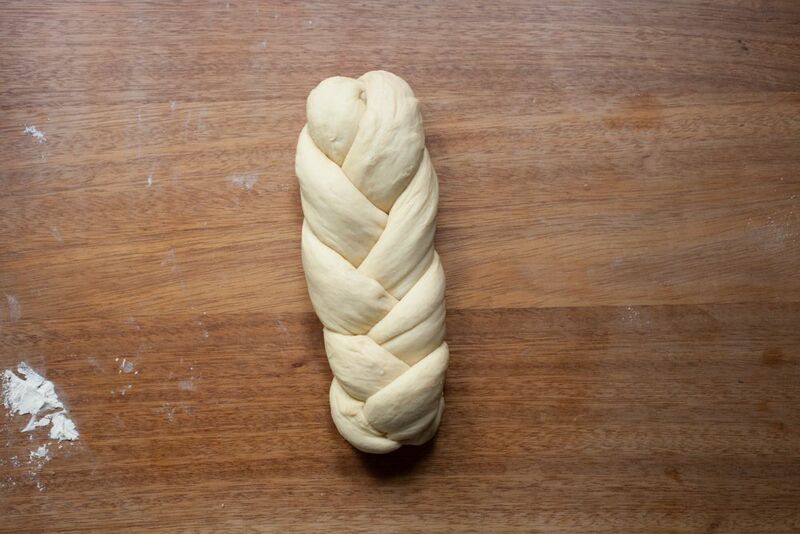 When you get to the end, press the strands together and tuck both ends under the loaf (like this). Transfer to a large, lightly greased baked sheet. Cover with a clean tea towel and leave to rise again for about 40 minutes to an hour - if you poke it gently with a finger the indent should stay visible without springing fully back. Meanwhile, preheat the oven to 200C/390F (fan). When ready, add about 1/2 tsp of milk to the extra bit of egg and carefully and gently brush the loaf all over. Place a dish of boiling water on the bottom rack of the oven and then place the bread in the top half of the oven. Bake for 10 minutes then reduce the temperature to 180C/350F (fan). Bake for an additional 15-25 minutes or until the bread is a shiny and deep brown and sounds hollow when tapped on the bottom (I slightly overbaked the loaf in the photos by mistake, but only just). Remove to a wire rack to cool fully before slicing. Last year I decided to create a reader survey to gather some answers for a few questions I'd been mulling over to do with the blog and blogging in general. It was brilliant to hear from so many readers (762 to be exact) and to get a feel for your thoughts. This year the focus is slightly different but the survey retains the same format. There are ten questions - they're mostly multiple choice for speed and ease but there's room for writing too. None of the questions are compulsory and the survey is anonymous. I hope you enjoy completing it - it was wonderful to read the responses last year and I'm looking forward to seeing what you have to say this year. The survey is now closed. Thank you for all of your responses! P.S. The weather is warming and so I'm dreaming about ice cream again... the top photo is Raspberry Froyo and the bottom is Choco-Caramel Sauce. Back in April, Mum asked for three things for her birthday tea: chocolate cake, praline and ice cream. A coeliac friend was coming to the tea so it also had to be gluten free. Mum had already tried making this chocolate torte with cocoa powder instead of flour, so I decided to start with that. Next, I made a batch of my favourite vanilla ice cream. On a whim I ground the praline down to a fine crumb, which turned out to be wonderful (both on top of the torte and on a spoon). Last weekend I went to Wales to celebrate a housewarming and generally enjoy the bank holiday. I thought this would be a good recipe to take down as the torte improves with time so it didn't matter which day we ate it. I kept the praline in a separate airtight box (it doesn't keep well on top of the cake) so I'm afraid I don't have an image of the assembled cake for you. Despite that, I think you can imagine it: a dark torte topped with a thick layer of nutty, crunchy praline crumbs and a big scoop of melting ice cream to meld it all together. Preheat the oven to 180C/350F (fan). Lightly butter a deep 8"-9" springform or loose-based tin. Place the hazelnuts on a small tray in the oven and toast for a few minutes until they start to smell and darken and the skins begin to split open. Rub any loose skins off with a clean tea towel or kitchen roll. Put into a food processor with the cocoa powder and blast until they are finely ground. Place a mixer bowl over a pan of barely simmering water. Chop the chocolate and tip into the bowl. Stir occasionally as it melts. Meanwhile weigh out the brown sugar and salt and cut the butter into cubes - it should be starting to soften, not squishy. When the chocolate has nearly melted, take it off the heat and stir until it's smooth. Place on the mixer (with the whisk attached) and add the sugar, salt and butter. 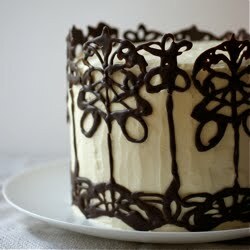 Whisk on medium until the ingredients have fully combined and the mixture has lightened a little. Scrape the sides down then add the first egg. Whip until combined, then add the next egg. Repeat until they're all combined then add the vanilla and whip for 2 minutes on high until stiff and pale. Add the cocoa-ground hazelnut mixture and fold in. Scoop into the pan and level out. Bake for 23-30 minutes - a tester should still bring up a sticky crumbs and it won't look fully cooked in the middle (a bit like brownies - don't overcook it or it gets dry and crumbly). Place on a wire rack and leave to sink and cool fully in the tin. Wrap in kitchen foil and try to leave for at least one day and up to three before serving. To make the praline topping, place a sheet of baking parchment near the stove. Toast the hazelnuts (as above, or in a frying pan until a similar stage) - they need to still be warm when they're combined with the caramel. Spread the sugar over the bottom of a medium sized heavy-bottomed pan and place over medium-high heat. Watch carefully - after a few minutes, the sugar will start to liquify at the edges. Don't stir it - you can flick some of the crystals onto a liquid bit, but don't fiddle too much. Once it's nearly all melted and starts to caramelise, swirl it all together. Keep heating until you have a deep golden-bronze colour then stir in the salt and the still-hot hazelnuts so they become covered in caramel. Quickly scrape it all out onto the baking parchment and spread out. Leave to cool (it's ready once the caramel snaps). Break into big chunks then place into a food processor (no need to wash between the earlier hazelnut/cocoa mix) and pulse until it is finely ground (same sort of texture as ground almonds). Spoon the praline over the top of the cake then serve. It's best with softened vanilla ice cream but a big spoonful of gently whipped cream or crème fraîche also works.